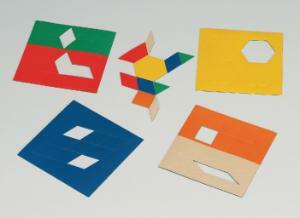 Patterns are so much fun to teach with these Magnetic Pattern Blocks. Using this great math manipulative, children will begin to understand both repeating patterns and growing patterns by experiencing what happens when these magnetic geometric shapes are arranged in a particular order. The blocks will adhere to classroom white boards or any other magnetic surface. The set includes 6 orange squares, 12 green triangles, 6 red trapezoids, 9 blue parallelograms, 4 yellow hexagons and 12 tan rhombi. WARNING: CHOKING HAZARD–Small Parts. Not for children under 5 yrs. This product contains a small magnet(s). Swallowed magnets can stick together across intestines causing serious infections and death. Seek immediate medical attention if magnet is swallowed or inhaled.